Medicated Follower of Fashion: Magpie Monday - Johnson Brothers etc.. I'm back for Magpie Monday! I've not had anything to write about for the last few weeks, bargain/charity related. On Saturday though, we were in town and decided to pop into just one charity shop (Ethan was with us and wanted to get home so he could ride his bike!). We picked Age Concern and in we went. Within seconds I spotted what I think is my top charity shop bargain EVER. Not only that, this is probably my favourite thing to have spotted in a charity shop. Something for someone else, something I just knew they would love. That's the best really. What had I spotted? 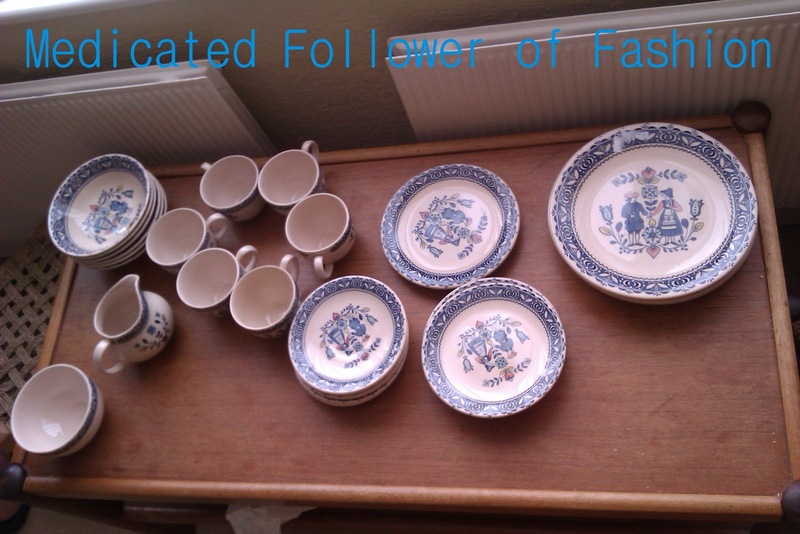 A huge haul of Hearts & Flowers crockery by Johnson Brothers. My dress came in at £4.99. 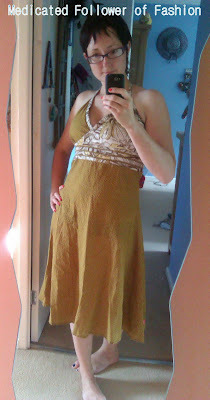 Not such a bargain, but still a good price and a nice dress. I wore it today and it's very "swishy" which I like! Sorry the photos are a bit rubbish, they are from my phone, all I've got at present! Please do go and visit Missie Lizzie's blog to see what the other Magpies have hauled in! Ahh how sweet! Are you going to gift it to MIL? She'll be over the moon I bet. I love spotting china from my youth in charity shops - I can even picture particular meals on them! Yes, we took it round to her on Sunday. She was amazed at how much there was. Now she's got to re-jig her cupboards, but it's worth it! 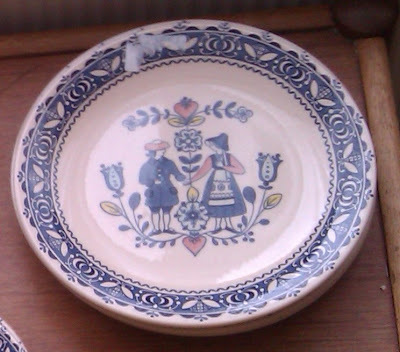 I can remember meals on plates from my childhood as well, though my parents have such a mishmash of plates. Denby is always a memory for me though. Ah, WOW. Such a brilliant haul and such a bargain too. I can just imagine how excited you were! I was buzzing for hours afterwards!